It can be a challenge convincing clients to add new strategies to their existing Web presence. In a perfect world, a client would simply say, “You’re the expert. You know what’s best. Do whatever needs to be done to make it happen!” But, unfortunately, it just doesn’t work like that. Granted, we shouldn’t expect smart business managers to implement every new thing just because we tell them it’s a good idea. That wouldn’t be cost effective. But what if you know in your gut that the future of a client’s business may be at stake? With Google executives saying things like “I believe that in 3 years desktop computers will be irrelevant…” and studies by Gartner stating that “Websites not formatted for the smaller screen will become a market barrier…” the Mobile Web is one of your gut instincts you want your clients to follow. And follow now! In a state of desperate urgency, you may be tempted to place all diplomacy aside, and just tell it to them straight, perhaps even reminding them of those other times they put off your advice. I like to call this the “Timeline of Lost Opportunities” tactic. You may very well have clients who respond to that type of pressure, but more likely, you will need to ease your clients into the idea of a full-on Mobile Web strategy. The Mobile Web is upon us, whether we like it or not. People are using mobile devices to search, shop and click through on ads at unprecedented rates. And rates that are only expected to grow. Presenting numbers like those shown above, as well as information on how their competitors may already be capitalizing on the Mobile Web, can get your clients listening. 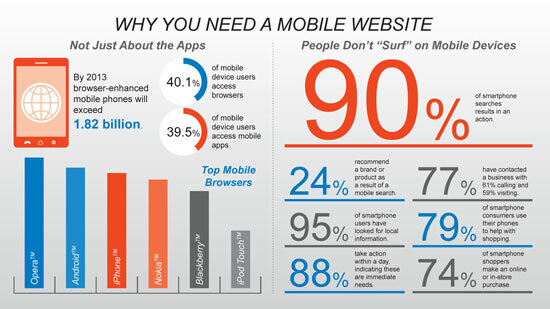 Mobile device users search the Internet as often as they use apps, so having a mobile-ready website is important. 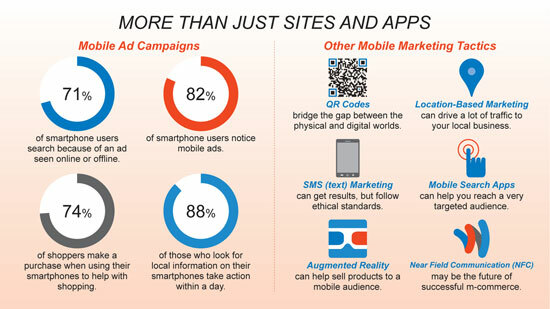 Mobile consumers know what they want from a website, and typically take action once they get there. It’s important that your clients understand that their customers have different expectations of what a mobile website does and provides compared to their existing website. Mobile conversion rates can be impressive, but only if a website caters to the expectations of this mobile audience. Once you’ve shown your clients how people use mobile devices, it should become more apparent that they need a mobile version of their website. 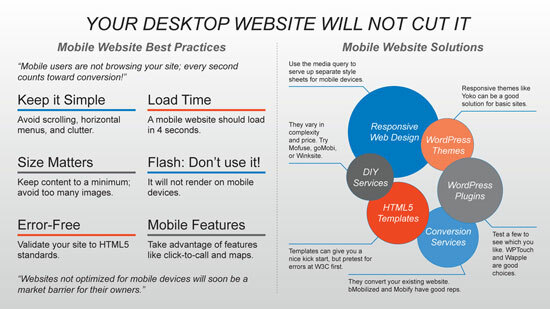 Mobile website solutions need not be complicated or expensive. Show your clients some options, such as responsive web design or going with a dedicated mobile-optimized version of the site (along with the pros and cons of each) while emphasizing mobile website best practices. Mobile app usage is impressive, but while people do spend a lot of time using mobile apps, most of that time is spent on games and social networking. So does your client really need a mobile app? You can help them decide by weighing the pros and cons of mobile app development, and presenting ways they can optimize their mobile website as an alternative. 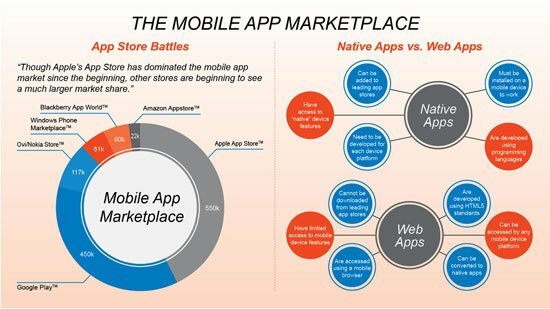 A good mobile app strategy should analyze current marketplace trends and weigh the pros and cons of developing native apps versus web apps. 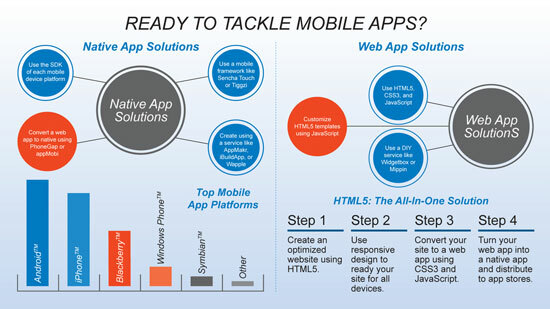 Be sure to explain how the mobile marketplace works as well as the difference between native and web apps. This can help your clients make more informed decisions. 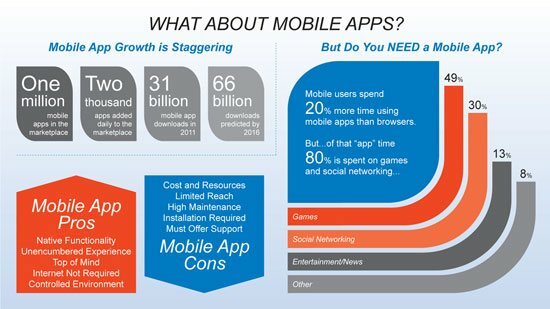 Mobile app solutions vary in price and complexity. Outline options for your client that include using HTML5 or one of the many do-it-yourself mobile app tools available today. Make your recommendations based on the client’s present and future needs. 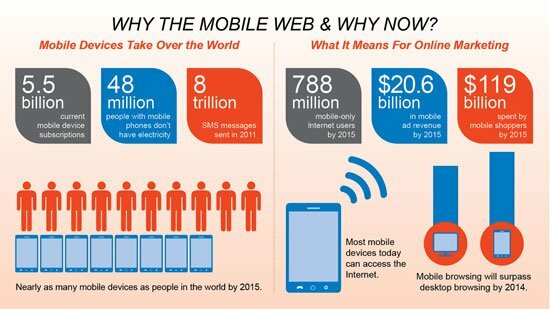 The Mobile Web is more than just websites and apps. From QR codes to augmented reality, there are a host of tactics and tools you can implement to help your clients promote their business on the Mobile Web. Help your clients understand the importance of mobile-optimized landing pages. When they are marketing to a mobile audience, it is imperative that clients ultimately send potential customers to landing pages and other sources compatible with the customer’s mobile device. The goal should be to educate your clients on the “hows” and “whys” of the Mobile Web and to help them understand their options. This approach can ultimately help them make informed decisions as they consider your recommendations. This article is based on the book, The Bootstrapper’s Guide to the Mobile Web. The graphics used in this article are part of a sharable infographic available at TheBootstrappersGuide.com, where you’ll also find free mobile website, mobile app, and other mobile strategy worksheets. Will the Browser Wars Invade the Mobile Web?